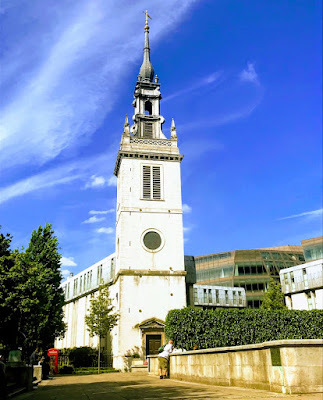 On my walks between Liverpool Street Station and the offices of USPG in Southwark two weeks ago [9 May 2018], I stopped to look at the remaining towers of two lost London churches: Saint Augustine Watling Street, which stood to the east of Saint Paul’s Cathedral in the City of London, and the Church of Saint Mary Somerset, where Upper Thames Street and Lambeth Hill meet, south of Saint Paul’s. Both churches were rebuilt in the late 17th century by Sir Christopher Wren after the Great Fire of London. Saint Augustine Watling Street stood on the north side of Watling Street, at the corner with Old Change. According to Richard Newcourt, the dedication of the church was to Saint Augustine of Canterbury, rather than Saint Augustine of Hippo. was first recorded in the 12th century. The church is first mentioned in 1148. In 1252-1253, Alexander le Cordwaner made a grant of land on the north side for the enlargement of the church. Archaeological evidence indicates that the 12th century church was about 19 metres (61 ft) long, the 13th century extension 18 metres (59 ft) long, and 4.9 metres (16 ft) wide. Writing at the end of the 16th century, John Stow called Saint Augustine’s ‘a fair church,’ adding that it had been ‘lately well repaired.’ The church was partly rebuilt, and ‘in every part of it richly and very worthily beautified’ in 1630-1631, at a cost to the parishioners of £1,200. The mediaeval church was destroyed in the Great Fire of London in 1666. After the fire the parish was united with the parish of Saint Faith under Saint Paul’s, whose congregation had worshipped until then in the crypt of Saint Paul’s Cathedral. The church was rebuilt to the designs of Sir Christopher Wren in 1680-1684. The new church opened in September 1683, but the steeple was not finished until 1695-1696, with a spire designed by Nicholas Hawksmoor. The church interior was about 16 metres (51 ft) long – shorter than the mediaeval building – 14 metres (45 ft) wide and 9.1 metres (30 ft) high. The nave was divided from the aisles by an arcade supported on Corinthian columns with unusually high bases. The naves and aisles were barrel vaulted, and the nave vault was pierced by three skylights on each side. There were galleries on the north side and at the west end, but the west end gallery was taken down when the organ was moved to the south side. The walls were originally panelled to a height of 2.4 metres (8 ft), but this was later considerably reduced. The reredos had Corinthian columns and the pulpit was of carved oak. Archaeological investigations during excavations in 1965 revealed the foundations mostly of re-used stones set in mortar. The rectors of the church included John Douglas (1764 to 1787), later Bishop of Carlisle (1787-1791), Dean of Windsor (1788-1791) and Bishop of Salisbury (1791-1807); and Richard Harris Barham (1842 to 1845), author of the Ingoldsby Legends. The tall leaded spire that was modified in 1830, and the pulpit was modernised by Arthur Blomfield in 1878. Wren’s church was destroyed by bombing during the World War II in 1941. The remains of the church were designated a Grade I listed building in 1950, but the church was not rebuilt. However, the tower was restored in 1954 and the spire was rebuilt in 1966 according to its original design by Paul Paget of Seely and Paget. The foundations of the northern half of the mediaeval church were revealed when burials were removed in 1965. The tower and spire were incorporated into a new choir school for Saint Paul’s Cathedral in 1962-1967. The brief dictated that the new building should incorporate the restored spire and that no part of the school would be higher than its cornice. The tower is built of Portland stone in three stages with an oculus at the second stage and rectangular belfry apertures at the third stage. It is capped with a cornice, a lacy baroque pierced parapet and corner pinnacles of baroque obelisks. Rising behind this is the lead spire, which was restored in 1967 to Hawksmoor’s original design, and featuring curved brackets rising to an open stage with urns and the distinctive elongated onion dome. To the south is a pedimented door, and to the east are exposed rubble walling and quoins at the lower stage. Although the body of Wren’s church is now lost, Saint Augustine Watling Street remains the closest of the City Churches to Wren’s Cathedral and its tower remains a special landmark in the City.